Joy Lehuanani Enomoto was born and raised in Los Angeles. She received a BA in English from UC Berkeley. She moved to her fatherʻs hometown of Makawao, Maui in 2002 and moved to Mānoa in 2010, where she received a second bachelor's degree in Fine Arts with a focus on photography. While pursuing this degree she worked for Hamilton Library's Preservation department and worked closely with the rare book collection. Joy is currently pursuing a dual masters' degree in MLISC and Pacific Island Studies. She is the Student Reference Intern for the Hawaiian & Pacific Collections and a Student Assistant providing reference and processing archives for the Archives and Manuscript Department. Joy is the newly elected chairperson of Nā Hawaiʻi ʻImi Loa student chapter. She hopes to support Pacific Island communities in their efforts to preserve archives and collections during the increasing threats of climate change and is committed to creating ethical guidelines and protocols for researchers handling Hawaiian and Pacific materials. Keahiahi Long lives in Maunalua, Oʻahu, is a practicing mea hula, and is the Librarian at the Kamakakūokalani Center for Hawaiian Studies at the University of Hawaiʻi at Mānoa. Her primary duties are to support the creation of, access to, and use of materials related to ʻike Hawaiʻi, and to manage the Laka me Lono Resource Center so it best aligns with the mission and goals of Kamakakūokalani. Keahiahi holds a Master’s Degree in Library and Information Science and Bachelor’s Degrees in Hawaiian Language and Hawaiian Studies from the University of Hawaiʻi at Mānoa. Keahiahi's professional interests include Hawaiian, Indigenous, and Digital Librarianship, as well as Information Literacy instruction. Keikilani Meyer was born in Honolulu, raised in Kailua, and lives in Pauoa. She received her MLISc in December 2014. Prior to receiving her degree, Ms. Meyer was the Interim Director for ALU LIKE, Inc.’s Native Hawaiian Library for seven years. She currently oversees the Hawaiian-Pacific and Nursing Collections for the Sullivan Family Library at Chaminade University of Honolulu. She is the current President of the Hawaiian-Pacific Chapter Special Libraries Association. Ms. Meyer is a second year doctoral candidate in the Interdisciplinary Communication and Information Sciences Program at the University of Hawai‘i at Mānoa. Annemarie Aweau Paikai was born and raised in the East San Francisco Bay Area. She received her B.A. in Hawaiian Studies from the University of Hawaiʻi at Hiloʻs Ka Haka ʻUla o Keʻelikōlani, College of Hawaiian Language, while concurrently training as a hula practitioner under the hālau Unukupukupu located at Hawaiʻi Community College. She received her MLISc from the University of Hawaiʻi at Mānoa in December 2013. Annemarie is currently serving as a Librarian III at the Hawaiʻi and Pacific Section of the Hawaiʻi State Library and lives in Waiau, Oʻahu with her husband and 13 month old son. Annie Keola Kaukahi Thomas was born in Hilo, raised in Maunawili, and currently resides in Mānoa. 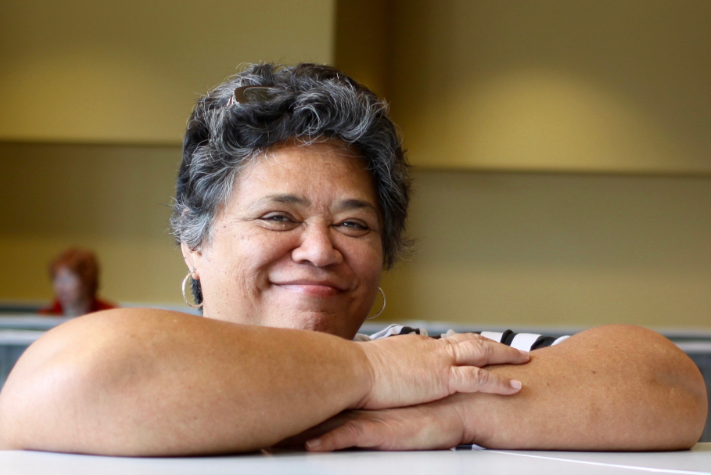 She has served as the Hawaiian Resources Specialist Librarian at Kapiʻolani Community College since 2013 and worked for the Hawaiʻi State Public Library System from 2007-2012. She received her MLISc from the University of Hawaiʻi at Manoa in 2006.